Whether your team’s hiring its first remote employee or its 79th, don’t skimp on putting thoughtful intention behind your new hire onboarding program for remote workers. Go ahead, pick out your worst fear about hiring remote workers below. If I can’t see them, will they just do their laundry instead of work? Our employees need to be “on” during our regular working hours, how can they if they’re roaming coffee houses around Europe with a 6-hour time difference? Company culture and connectivity will suffer if we can’t play ping pong in person together, won’t it? many of us share our latest “water cooler” moments via Slack for a quick personal connection break. Our organization has come a long way; however, we haven’t yet fully adopted the mentality of “remote first.” That is, truly distributing the workforce in such a way that remote work is the default setting–not just an option available to some. SaaS companies like StackOverflow and HelpScout are worth further investigation if you’re considering this cultural pivot for your employer. Personally, I’m going to advocate for an ExactHire version of StackOverflow’s “Bev Bash” in which a videoconference-driven happy hour periodically takes place! Remote first = distributing your workforce in such a way that remote work is the default mode. Another relevant read is Remote: Office Not Required by Basecamp Co-Founders, Jason Fried and David Heinemeier Hansson. This book details Basecamp’s evolution into a remote first organization, including both the pitfalls and unexpected wins along the way. There’s no shortage of inspiration on how to make remote working arrangements possible for your organization these days. In this post, I’ll focus on how to not screw up employee onboarding once you’ve committed to hiring a new fully-remote employee. For someone who is brand new to your organization and away from the office from the start, consider these items for your onboarding checklist. In the absence of in-person onboarding activities, picking up on body language and being a bystander to water cooler talk is more challenging. Therefore, organizations should put themselves in the shoes of new hires and brainstorm the details that new employees won’t necessarily absorb on their own. Being transparent about expected working hours (despite time zone of new hire), explaining how organizational culture manifests itself and sharing milestone targets about what job success looks like at three months, six months and beyond are just a few of many possible details. For example, in Remote, the authors talk about how it’s important for Basecamp to give its new hires a heads up that they may be bombarded by social media follower requests when joining the organization. Because their company is remote first, it has become common for employees to connect with one another on social media in order to get to know each other more quickly in the absence of traditional face time in the office. Nothing can trip up a remote working arrangement more quickly than a shortage of sufficient communication. If your company wants to make remote work work, then you need to commit to many modes of communication (“different strokes for different folks”) and in particular, abundant written communication. Particularly if your remote employees are spread across different time zones, a bigger portion of your company’s internal communication will be asynchronous–with employees reading email, chat messages and Slack updates anywhere from minutes to hours after they are originally sent. To amplify the effectiveness of asynchronous communication, be clear about your needs and consider capturing screenshots and creating short videos to better explain tasks and challenges to co-workers when big time zone differences diminish the ability to connect in real time. Consider your communication culture and whether it makes sense to go to the extent of asking people to update their status when away from Slack, instant messenger, etc. While ExactHire doesn’t quite go this far, we do have an internal document that lists general working hours for all employees since individual availability varies widely depending on the day of the week. While we’ve already established that communication is critical, committing to written communication goes deeper than the one-off messages and company announcements that happen on a daily basis. In the same way that ExactHire maintains a support knowledge base full of training documents for our customers about our products, employers with remote workers have an even greater responsibility than traditional employers to document policies, project statuses and resources in an internal knowledge base. And, it’s not just about basic documentation, but also the style or approach you take for documentation and communication. For example, at a previous employer I was quickly indoctrinated into the organizational norm of referring to all employees by just their initials in written communication, as well as the practice of hiding unwieldy URL addresses behind anchor text in interoffice emails. Mind you, this was a decade ago…before it was a tech-based cultural norm to go to such formatting lengths. Internal consistency in communication supports effective organization. Additionally, having easy-to-use tools to track items is essential. 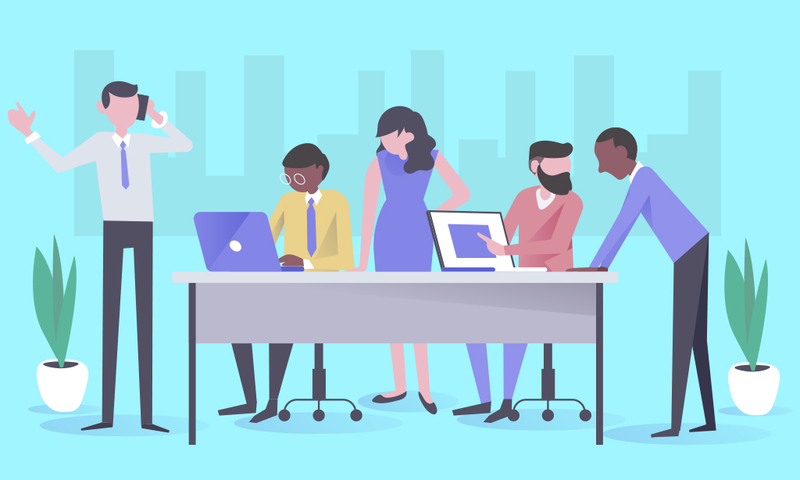 For example, in addition to Slack, ExactHire has leveraged platforms such as Google Docs, Trello, Basecamp and Jira for internal collaboration on a daily basis in recent years. For both new hires and existing staff members, the employee onboarding process is full of opportunities to miss details. Take the pressure off of remembering which employees should be prompted to complete which new hire documents, tasks and forms by leveraging employee onboarding software. An effective onboarding platform automatically presents the right paperwork, onboarding tasks and training prompts to different new hires based on factors such as their geographic location, FLSA status, security clearance and role type. Because additional to-do items are only presented to new hires and internal onboarding process stakeholders when certain basic prerequisites are already satisfied earlier in the process, the experience for the new hire is positive and stress for the staff member is minimal. It’s stressful enough for a new hire on her first day at a new job in a traditional office. Now imagine how much more awkward a remote employee’s first day on the job can be if the employer is unprepared for her arrival. Prepare new hires to hit the ground running quickly by sharing a super detailed onboarding plan and training schedule with them before their first day. Include links to your internal knowledge base and make resources for additional learning easy to find and searchable. This written documentation will easily fill the gaps between video conference calls and virtual job shadowing sessions with co-workers. From a hardware standpoint, outfit new employees with the equipment they need to start work on day one. Your approach to this will vary depending on whether you ship a computer, phone, headset, etc. to your remote employees or have a policy in place that allows them to bring their own device (BYOD) to work. Regardless of your approach, make sure that all equipment and software access follows internal security protocols and that new hires are trained on how to handle secure data and what to do in the event of a breach. Be sure to give new hires access to relevant communication groups, recurring calendar events and internal online resources in time for their first day–along with instructions or a description of each item’s objective. There’s no quicker way to alienate your remote employees than to forget to add them to your monthly all-hands meeting call, and then interrupt it fifteen minutes in to invite them to join last late. Fostering connectivity can be a struggle in a remote-driven workplace–especially in an organization that has transitioned from a traditional in-person office to a distributed workforce. While veteran employees instinctively understand the core values, mission and unwritten ways of doing things, newly hired remote employees won’t become a thread in the organizational tapestry without understanding its roots and also being prompted to share their own background. Create a series of videos about key aspects of the company’s past that can be embedded into the onboarding process. Host a monthly company trivia session where employees log into Google Meet or Skype to answer questions and compete for swag. Telling the organizational story to new hires is a best practice, but savvy employers will also build in the opportunity for its diverse new employees to make their own mark and share their own background. This might be accomplished with a virtual employee directory that features fun facts about new hires; or, occasional “lunch and learn” webinars that invite new employees to do a show and tell about their own city/country or hobbies and interests. Mentoring is not a new concept for employee onboarding; however, adopting it as a practice for a remote workforce is an emerging trend. From job shadows with veteran employees in a new hire’s first few days to monthly milestone check-ins with a designated “buddy,” virtual mentoring has a great deal of possibility for remote-friendly workplaces. When creating a virtual mentoring program, account for factors that may influence likely success between mentor and mentee; such as, time zone difference, job role, interests and behavioral tendencies as evident from an employee assessment. Take 1-on-1 mentoring a step further and invite mentors and mentees to quarterly tweet-ups or video conferences in which newer hires have a forum in which they can ask questions of mentors in real-time and within a group format. By listening to the questions and answers of peers, as well, new hires will likely shorten their own learning curve. When done right, remote work allows employees to focus for longer periods of time without interruption. While distractions may occur in both the office and at home, there’s a distinct difference between immediately responding to someone knocking on your door versus waiting a few minutes to finish a task before responding to an email. Utilize video conference platforms such as Zoom or GoToMeeting to allow all employees to synchronously connect whenever the need arises. Perhaps your cultural norm is even to ask employees to always use video chat rather than voice-only phone calls when connecting for a meeting. However, when planning such video calls, and to be considerate of potential time zone differences, be intentional with the time allotted to focus on social connectivity rather than just covering things that might be more efficiently discussed via email. Even in modern, 100% remote first workplaces, there’s a place for in-person interaction. Many employers that have largely distributed workforces still make time at least once per year to gather in person for social connection–as an entire organization. And while this type of event can inflate the company travel line item significantly, that is the tradeoff between having the overhead attributable to a physical office location versus employing a remote first approach. If that approach would break your budget, then consider smaller meetups between departments instead. Emojis were once reserved for text-happy teenagers lamenting their latest breakup; however, in recent years they’ve earned their place as a remote work mainstay because they help express tone and emotion in a situation that might otherwise omit context for one’s mood. And while it might still be a stretch for some to include them in email messaging, they thrive in messaging platforms such as Slack. And, they’re particularly helpful in a remote workforce when employees may have never met in person and do not yet understand the nuances of their peers’ personalities. Emojis are one way of leveraging feedback on a micro level so that remote employees can gauge how they’re communicating or performing. On a macro level, employers hiring remote employees must give and receive feedback early and often throughout the onboarding process. Gather new hire input in the pre-boarding phase to make sure that incoming employees have a firm grasp of the resources available to them to get started. Hold virtual town hall meetings for new hires three months into their employment tenure for ideas on how to improve remote employee onboarding. Make sure that supervisors have a regular cadence of offering constructive feedback to direct reports throughout the first year of employment, especially. Make your objective to create experiences in which remote employees feel as assimilated and supported as traditional in-office employees. Remember that it will take some experimentation, careful hiring and an open mind. If you don’t get it exactly right the first time, gather feedback to make an adjustment and try, try again!